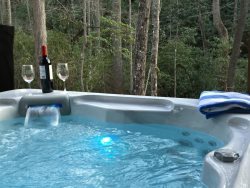 Secluded Mountain Getaway, Log Cabin, 2 bed/2 bath/ Hot Tub, Fire Pit, Hendersonville, near Asheville. Red Bud Tiny House, Village at Flat Rock, A Simple-Life Community, 2 Bedroom, 1 bath. Dogwood Tiny House in the Meadows. Cozy Cabin Tiny House at the Village of Flat Rock, NC. , Loft and 1 private bedroom. Tiny House Petite Fleur, Warm inviting space to rejuvenate and unwind for a time.